Riddle me this: What’s the first thing anyone notices about your physique? What’s the first thing that tells the world whether you’re strong, or a total wimp? If you’re still guessing, here’s the answer: It’s your arms. Let’s face it. The size and shape of your arms are visible under anything but the bulkiest of winter coats. Puny arms can be spotted a mile away, and big, muscular arm muscles are what separate the men from the boys. Flabby arms make you look fat and out of shape. Skinny arms make you look like a complete weakling. Only large, muscular arms make you look strong. Go out on a warm day. Look for someone in short sleeves. Do you notice their stomach, or their neck? Not likely. In fact, you probably saw their arms before anything else, and in a fraction of a second, judged their strength, health, athleticism and even ability to lead others based on their triceps, biceps and forearms. What you’re about to learn in this advanced arms workout will change the way you train your arms forever, and will arm you with all the knowledge you need to finally develop the strongest arms your genetics will allow. I have designed what I believe to be one of the best arm development programs available. Your skinny arms don’t stand a chance… growth is inevitable! In this guide, I aim to deliver information that not only tells you what to do, but also why you’re doing it. When you know what’s going on under your skin it takes your training to a whole new level. As I’ve already mentioned, your arms are a very visible part of your body, and usually the first place someone will look to gauge how strong and muscular you are. Let’s face it, most guys want three things in life – impressive bench press strength, ripped abs and big arms. Unfortunately I can’t address all three today, but I can take care of your skinny arm problem. What’s the first thing someone usually does when asked this question? They don’t strip down and pull a Front Lat Spread or Side Chest Pose, No. They flex their biceps, raise their arms and hit the classic front biceps shot. The desire for guys to want big, impressive arms is understandable, but growth can be a real sticking point for some people in this area. Maybe you’ve just starting weight training for the first time and want to get a head start on your arm development. Or maybe you’ve been training for some time and built and overall muscular physique but your arms are lagging behind in the growth department. Or maybe you just want to fill the gap in your sleeve and look good in a t-shirt. Whatever your reason for wanting bigger arms, the information in this guide and the workout program will get you the sleeve-bursting arms you’re after. It’s the biggest, baddest arm workout in the history of the human race… okey, I’ll calm it down, but seriously, this is one highly effective growth inducing workout. There are a lot of poorly designed and ineffective arm development programs out there, which played a part in my motivation to write this article and workout. Some of the arm building programs that I’ve seen will have you train arms alone for a set number of weeks while completely neglecting all other muscle groups. This is a terrible way to structure any workout routine. Not only will this result in an unbalanced physique (arm muscles become disproportionately bigger than other muscle groups) but you will miss out on the synergistic effect that training large muscle groups has on arm development. For example, all upper body pushing exercises such as bench press for the chest and overhead shoulder press involve the triceps. All upper body pulling exercises such as bent over rows and pull-ups for the back muscles involve the biceps. Keeping compound exercises that target large muscle groups in your arm focused training routine is highly beneficial to your arm development. It makes no sense to eliminate other muscle groups when embarking on an arm focused training program, since training other large muscle groups also activates and stimulates growth of the arm muscles. Training back, chest and shoulders will indirectly help in the muscle and strength development of the arms. Also, your shoulders are part of the arms so it’s important to include this muscle group as part of an overall arms development program. Another thing I see with arm building programs out there is the ridiculous claims in size gains they make. Not only are some of these claims untrue, they’re actually charging for the information, usually in the form of some downloadable digital document. These kinds of claims piss me off because they’re scams. There is no way in hell anyone on this earth can put 2 inches of muscle tissue onto their arms in a week, period! Sure, you may be able to temporarily increase the size of your arm by an inch or two in a week. But that extra size is not pure muscle, it is inflammation and fluid retention. Heck, I’ve seen people add an inch to their arms in one 30 minute workout from creating a huge pump. The muscular “pump” is caused by trapped plasma within the muscle. Repetitive and intense muscular contractions increases blood flow in the muscle which forces plasma from the capillaries into the interstitial spaces of the muscle cells, creating the appearance of a bigger muscle. Bodybuilders commonly perform exercises to “pump” their muscles up before appearing on stage to make their muscles appear bigger and fuller. But this is just temporary “fake” size. Within hours the blood drains, the pump in gone and the muscle returns to its normal size. This arms workout is definitely not your typical muscle-pump-up program. It is intelligently designed to achieve maximum growth of muscle tissue. Sure, you may experience a great pump from this training routine, but that is just a side effect. The information, exercises and structure of workout in this guide will provide you with the tools you need to build real muscular arms – not some temporary “pump”. Before we get to the main workout routine and training variables, we’re going to cover the functional anatomy of the main arm muscles. This will help you understand what’s going on behind the scenes and to understand exactly which muscles you will be targeting for growth. The biceps brachii are the muscles on the anterior (front) of the upper arm. Hopefully that wasn’t a shocking surprise to anyone. There are three main muscles located on the front of the arm that we are most interested in. The biceps have two heads: The Biceps Brachii long head that is located on the outside part of the arm and the Biceps Brachii short head that is located on the inside part of the arm. The primary function of the biceps is flexion of the elbow bringing the hand towards the upper arm and rotation (supination) of the forearm. A lot of people don’t realise that when you rotate your wrist from palms facing down (pronation) to palms facing up (supination) that the biceps muscles are controlling this movement. Give it a try, with your right upper arm perpendicular to the floor lift your forearm out with your palm facing down. Squeeze your right bicep with your left hand. Now rotate your right hand to bring your palm facing up. You can feel the bicep working with just this small rotating movement. It’s also important to know that the biceps don’t work alone. There are two other supporting muscles. One is called the Brachialis which is located under the biceps, and acts like a second bicep. The brachialis is not involved in pronation or supination. The main role of this muscle is to help flex the elbow joint. The Brachialis has great potential for growth but is often underdeveloped. Targeting this muscle with some specific training techniques is a sure way to add extra size to your arms. The other muscle I briefly mention is the brachioradialis which is really more part of the forearm but plays a supporting role in biceps movements and makes up a good part of the arms thickness. It’s common for people to train the upper arm and completely neglect this muscle. But if you really want overall impressive arms then you must train this muscle in harmony with the upper arm. Having large muscular upper arms and thin weak forearms will look less than impressive. I mean, it would be like having a well built upper body mounted in skinny legs – it would very out of place. To build the biceps the following workout incorporates exercises for both flexion and supination, and by manipulating the position of the shoulder you will be able to enhance recruitment of ether the long or short head of the biceps. Biceps exercises performed with your elbow behind the midline of the body better recruits the long head of the biceps. 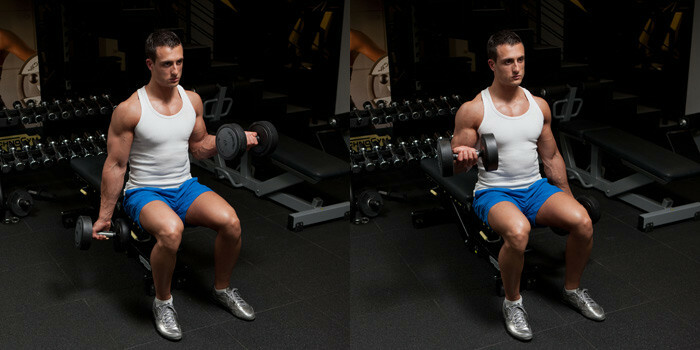 Dumbbell curls performed on an incline bench is a good example of an exercise that puts slight more stress on the long head of the biceps. Biceps exercises where the elbow is in front of the midline of the body better recruits the short head of the biceps. Preacher curls is a good example of an exercise that puts slightly more stress on the short head of the biceps. Effective exercises to develop the supporting muscles of the biceps (Brachialis and brachioradialis) are included in the workout. I will cover all the best arm development exercise in greater detail later. But first, let’s take a look at the anatomy and function of the triceps muscles. If you want big arms, you must give your triceps the same mass building attention as your biceps. When it comes to the muscles of the arm, most people pay way to much attention to training their biceps, and neglect their triceps. Building bigger arms is more than just building biceps. If you really want to have sleeve-bursting arms you’ll need to do more than just biceps curls, because the triceps comprise of around 75% of the arm. The triceps brachii is a muscle comprised of three heads (hence the name triceps – Latin for “three-headed arm muscle”) and is located on the back of the upper arm. All three heads of the triceps brachii converge and insert onto the Olecranon process of the ulna – more commonly known as the elbow. Is located on the outside of the arm and is the most visible part of the triceps. This part of the triceps muscle originates on the upper humerus and attaches at your elbow. Is located on the inside/back portion of the arm and connects to the scapula. This part of the triceps muscle is slightly different from the lateral and medial head because it connects from the scapula bone on the back to the elbow. The triceps work as a whole with the primary function of extending the elbow joint (straightening the arm). As covered above, the triceps are composed of three heads. All three heads work together when doing any triceps exercises. It is impossible to contract one head without involving the others. However, with certain exercises and training techniques we can apply more tension to a chosen head of the triceps. For example, putting your arms over your head isolates the long head of the triceps. When you perform an overhead triceps exercise such as dumbbell or rope attachment triceps extensions you stretch and isolate the long head of the triceps. This arms workout program includes a variety of exercises structured to hit all of the main muscles of the arms for maximum development. This workout program is structured so that you are training the muscle optimally at different points of the strength curve. What this means is that you will be developing strength through the full range of motion. Most people develop maximum strength at the middle of the range. For example, when doing barbell curls, the point where the dumbbell reaches the middle of the movement is where the muscle is placed under the most stress and tension. Therefore the muscle will develop the greatest amount of strength in the middle of the range of motion. When the barbell is resting against the top of your thighs in the starting position of a biceps curl there is no tension doing through the biceps. 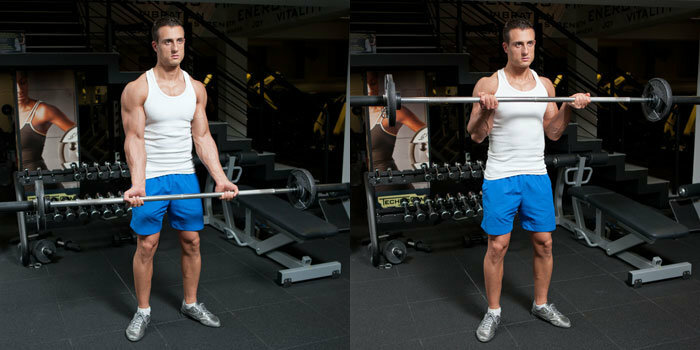 As you curl the barbell up the tension increases and peaks at the middle of the movement, then becomes less at the top. If you were to always just train biceps with exercises that maximizes tension at the middle of the range then you will become strong at this point of the strength curve, but weak at the beginning and end of the muscles range of motion. Adding an exercise like low cable curls will create maximum tension at the bottom of the range where dumbbell and barbell curls don’t. You can create greater overall stimulating of the muscle by apply tension at all points of the strength curve. Getting strong at the beginning, middle and end of a muscles range of motion results in greater development of that muscle. In this section we are going to cover the best exercises for arm growth. The muscle building exercises selected are based upon the physiological response induced by a particular movement. Though science has classified resistance training exercises in many ways, one of the most credible and complete classifications involves the use of EMG – Electromyography. EMG is a technique which records and evaluates the electrical activity produced within specific groups of skeletal muscles. Any movement causes electrical activity, and EMG allows researchers to determine which exercises produce the most activity. In knowing this, an objective measurement can be obtained. In Serious Strength Training by Dr. Tudor Bompa, Professor Emeritus, York University, Toronto, Ontario, Canada, results were obtained from the application of EMG to different muscle groups, and found that some exercises created more muscle building stimulation than others. 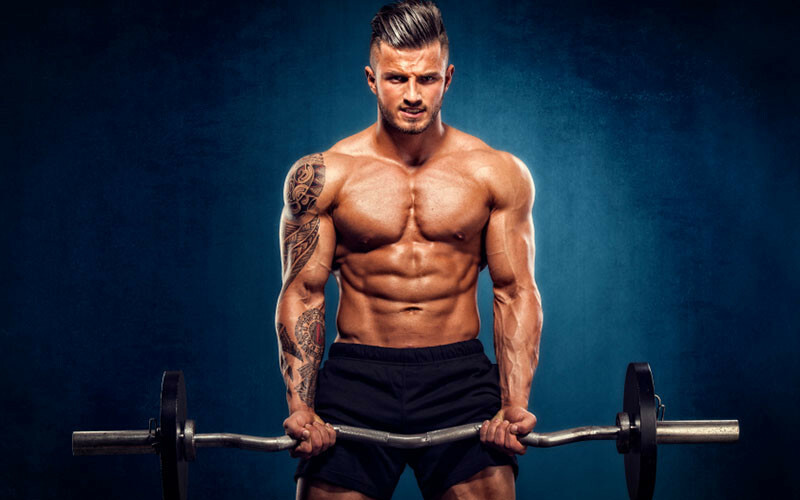 With the information from this study I have included some of the main exercises that have been proven to create the highest level of muscle fibre activation. Your arm workout will start with the big exercises first. This will make sure your muscles are fresh and ready to move the most amount of weight. Starting with big heavy exercises like barbell curls or close grip bench press allows you to overload your muscles with a lot weight to create a lot of muscle building tension within the muscle. The heavy lifts are followed by specific isolation exercises that really focus in on different areas of the arms to maximize development. The barbell curl should be a staple in your biceps building routine. This is a great mass building isolation exercise which works the Biceps Brachii, Brachialis and to a lesser degree the forearms. This exercise can be performed using either an EZ-Bar or Barbell. I recommend using the EZ-Bar if you have one available because it’s easy on the wrists and elbow joints, and more comfortable to use. Remember to keep your upper arm stationary to minimize any involvement of the shoulder muscles. Keep your upper arm straight and don’t swing the bar. Concentrate on contracting the biceps and only moving at the elbow joints. Chances are, the first time you started weight training you picked up a dumbbell and did some curls. This is a very popular and great isolation exercise that works the biceps in particular, but also the brachialis and brachioradialis muscles to some degree. The great thing about dumbbell curls is the ability to rotate your wrist as your curl the weight up. Remember, not only do the biceps create flexion (bending the arm at the elbow joint), but also supination (rotating the forearm). When you curl the weight up twist your wrist as far clockwise as possible at the top of the movement. Squeeze the biceps hard then slowly lower the weight for 3 – 4 seconds under controlled tension. Dumbbell curls take the biceps through their natural range of motion (flexion, protraction and supination) and allows you to twist, squeeze and fully contact the biceps at the top of the movement. Most people will do dumbbell curls by alternating between each arm after each rep, which is fine. But I prefer to train one arm at a time. For example, I will do 8 reps using my right arm then switch and do 8 reps using my left arm. I prefer this way of training the biceps because I get a great mind muscle connecting and I’m able to fully focus on one muscle at a time. The biceps are also under constant tension because you’re not letting them rest, as you would when alternating between arms after every rep. 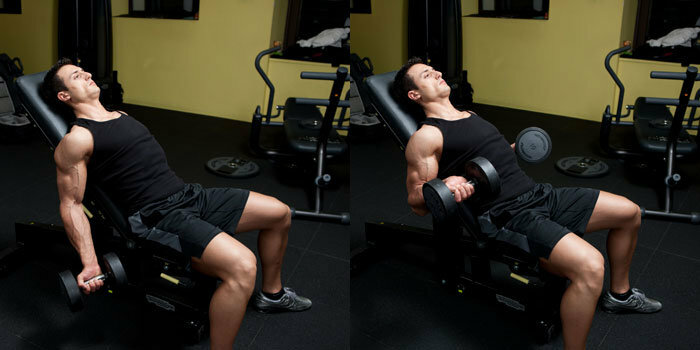 Performing dumbbell curls on an incline bench puts your elbows behind your body. Because the elbows are behind the torso during this exercise it will dramatically alter how you recruit your biceps, giving a great stretch of the biceps and more recruitment of the long head. 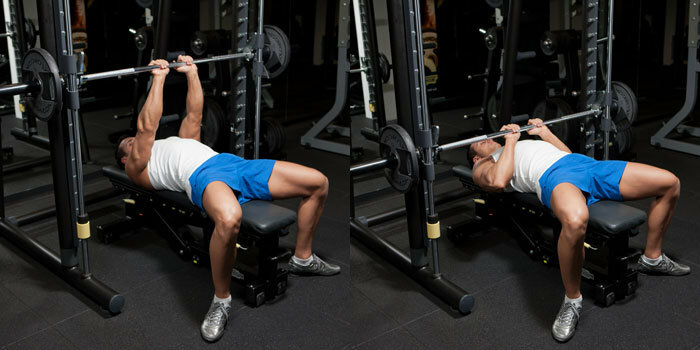 Set the bench on an incline just enough that your arms are behind your torso in the starting position. If you make the incline too low you could overstretch the biceps and create excessive friction on the tendon. Remember that classic front biceps shot most people hit when asked to show their muscles? Well this exercise helps to develop the inner short head of the biceps, the muscle most visible during a front biceps pose. Because your arms are in front of your torso during this exercise, the tension on the long head of the biceps is slightly reduced, placing more stress on the short head. This is one of the best isolation exercises for working the biceps, with a greater focus on the short head of the biceps and brachialis. It is a very strict movement that allows you to really focus on the muscle with a strong contraction. It’s impossible to involve other muscles and “cheat” with this exercise because your arms are fixed against a support pad. EMG testing showed this to be one of the top stimulating exercises for the biceps. This is an isolation exercise that mainly targets the brachialis, brachioradialis and to a lesser degree the biceps. It can be performed using dumbbells or rope attachment on a cable machine. This exercise is performed using a neutral grip (thumps facing up) which puts the brachialis muscle in a more direct line of pull, maximizing recruitment and development of the brachialis. This is an isolation exercise that targets the brachioradialis, and to a lesser extent the biceps. Performing a reverse grip curl (palms facing down) with an EZ-Bar or Barbell closes off the attachment point for the biceps, placing them in an inefficient line of pull. This means that the biceps lose their mechanical advantage, transferring a strong line of pull to the brachioradialis muscle. When curling with this pronated grip the brachioradialis muscles do most of the work. Because the small brachioradialis muscles are doing most of the work you won’t need to use a lot of weight for this exercise. Remember how I talked about there not being any tension at the bottom of a biceps curl when using a dumbbell? Well, this exercise is a great way to create a lot of tension at the bottom of a biceps curl. This is an ideal addition to a biceps routine because it puts the biceps in a lengthened position and builds strength at the bottom of the range. Perform the exercise one arm at a time using a single handle attachment on a low cable (stand facing away from the machine). This is a big compound exercise that gives you the ability to move a lot of weight, placing your triceps under great tension. It works all heads of the triceps, but recruits the medial and lateral heads better. When most people think of the bench press they think about training the chest. It’s true that bench pressing is primarily a chest exercise, but you’re also getting a lot of extension at the elbow which works the triceps. And with some adjustments to hand placement you can have the triceps do most of the work, making this a great mass builder for the triceps muscles. People make the mistake of having their hands too close together on the bar when doing this exercise. This can cause a lot of stress on this wrists at the bottom of the movement. You want to grip the bar about shoulder width apart, or so your arms are perpendicular to the floor. Another common mistake when performing this exercise is that people tend to flare their elbows out to the sides. Don’t – keep your elbows tucked close to the body throughout the whole movement. Watch the tutorial video linked below to make sure you are executing this exercise with perfect form. Dips are another great compound exercise that works all three heads of the triceps muscles at once. It has been called the “upper body squat,” but you must take great care to execute this exercise with perfect form. This exercise can cause stress and pain in the shoulder joint with some people. If you find this exercise very uncomfortable or painful around the shoulders then stop immediately. Some people don’t get on with dips, even if their form is good. If this exercise is not for you then replace it with close grip bench press. Lying triceps extensions (AKA Skull Crusher) is a very popular isolation exercise for the triceps. Some people find this exercise quit awkward and sometimes causing pain in the elbows. To make this exercise as comfortable and elbow friendly as possible use an EZ bar. If your gym doesn’t have an EZ bar or this still feels uncomfortable then use dumbbells with a neutral grip (palms facing each other). There are a few variations of the exercise. Some people lower the bar to their chin, others above their head. But as the scary name “Skull Crushes” suggests the bar is most commonly lowered to around the forehead. This is a very effective isolation exercise for the triceps. Because this exercise is performed with your arms overhead it gives a great stretch and better activation of the long head of the triceps. This exercise can be performed with dumbbells or rope attachment on a cable machine. Triceps push downs using a rope attachment engages all three heads of the triceps and more lateral head of the triceps more than using a bar. This is an absolute “must do” exercise to maximize triceps development. It creates great tension through the full range of motion and research using MRI has shown the straight bar variation of the Triceps Pushdown places the greatest emphasis on the lateral and long head of the triceps with moderate emphasis on the medial head. EMG testing showed this to be one of the top stimulating exercises for the triceps. This is an isolation exercise that mainly works the medial and lateral heads of the triceps muscle. Knowing which exercises are best for building big muscular arms is all well and good, but there are some crucial training components that are required to make any muscle building program successful. In order for this program to work, you must understand and apply these training components. This is the starting position of the movement. This is the end position of the movement. To really maximize grow from every repetition, science tells us that performing a fast, explosive concentric (lifting) contracting to be optimal. During muscle contraction, motor units and muscle fibres are recruited in relation to the force generated by the muscle. The more motor units and muscle fibres that are activated during a repetition, the greater the growth response. So, when you lift the weight it should be a fast, powerful contraction taking 1 – 2 seconds. A lot of people make the mistake of letting gravity do the work when lowering the weight, without much involvement from the muscles they are working. This dramatically reduces the time that the muscle is under tension and will result in less growth. The muscle should be under constant tension during the lifting AND lowering of the weight to maximize time under tension. Example 1: You do 8 repetitions of barbell curls. It takes you 2 seconds to lift the bar then you take 3 seconds to slowly lower the weight under tension. The muscle is under tension for around 40 seconds during one set. Example 2: You do 8 repetitions of barbell curls without controlling the weight on the way down. It takes you 2 seconds to lift the bar then you relax the muscle and let gravity do most of the work of lowering the weight. The muscle is under tension for around 16 seconds during one set. Can you see how it’s important to lower the weight under controlled tension? Studies show us that the eccentric (lowering) part of each repetition triggers muscle growth, and is just as important as the concentric (lifting). But you must lower the weight in a controlled motion while keeping the target muscle under tension. It should take 3 – 4 seconds for you to lower the weight to the starting position. Some people make a big deal about lifting tempo, counting every second of every part of the repetition. This is crazy and completely unnecessary. You don’t need to obsess over every second – trying to make sure each part of the lift falls directly in line with a prescribed lifting tempo. You don’t need to count the lifting tempo out in your head as you’re going through every rep. That’s just going to be a distraction. As you can see from the table above, moderate reps in the 6 – 12 range are optimal for muscle growth. Now, the important thing about reps is the weight you are using. Simply picking up any light weight and counting off 10 reps is not going to trigger growth. Muscles don’t responding to the numbers, they responding to tension. You must select a weight that causes you to reach failure (the point where you can’t perform another rep) between 6 – 12 reps. This ensures that the muscle you are training is getting sufficient tension and time under tension to maximize growth. In the arms workout program I have narrowed the rep range down to 8 reps per set, so you have a sweet spot to hit on every set. It may take a few “rehearsal” warm up sets for you to find an appropriate weight so that you are reaching failure around the 8th rep. If during a set you are able to do more than 10 reps easily then the weight is too light, increase the weight slightly on your next set. If during a set you are struggling to reach 8 reps then the weight is too heavy, reduce the weight slightly on your next set. The whole point of a workout program is to elevate the protein synthesis levels of a specific muscle group. The synthesis of protein is the method by which muscles are constructed. In this program you are focusing on maximizing arm growth, which means elevating protein synthesis in those muscles as high and as often as possible. Right now, your muscles are performing a balancing act known as protein turnover. Protein turnover is the balance between protein synthesis and protein degradation. More synthesis than breakdown indicates an anabolic state that builds lean tissues, more breakdown than synthesis indicates a catabolic state that burns lean tissues. There are a number of different stimuli that affects protein turnover, but the two we are most interesting in are exercise and nutrition. So what’s all this got to do with rest and recovery? After intense weight training our muscles go through a period where protein synthesis levels are increased. Depending on the intensity and volume of a training, protein synthesis level post exercise are elevated for round 24 – 72 hours. This means, the process of protein synthesis in building muscle tissue takes time and requires rest. This is why workout routines incorporate rest days, and muscle groups have a set number of days rest between workouts. The time between training a muscle group is your recovery period and your main focus during this time should be resting the trained muscles and supplying them with nutrients from food. Post exercise protein synthesis levels are only increased when sufficient amino acids from protein rich foods are present. If you are not supplying your body with protein during the rest and recovery period then you won’t see any gains in muscle growth from your workout. Which brings me to the next point… muscle building nutrition! The arm focused weight training program that follows is useless without a solid nutrition plan in place. It is physiologically impossible to build muscle tissue without sufficient nutrients. To build any amount of muscle you must eat! You must be eating more calories each day than you burn. This state is commonly referred to as a calories surplus and is an essential requirement for muscle growth. The very first thing you need to do is figure out how many daily calories you need to consume in order to build muscle. There are a number of different calculations and formulas for working this out – here’s a quick way to calculate calories. Poor nutrition is the number one reason that people fail to build an impressive amount of muscle. Going to the gym is the easy part, sticking to a diet plan from the moment you wake up till you go to bed is where people struggle. Don’t limit your results by being inconsistent with your nutrition. Anatomy and biomechanics of the main arm muscles. The best muscle building exercises for arm development. Optimal lifting tempo for muscle growth. Optimal rep range for muscle growth. Why rest and recovery are important for success. Now it’s time to take that information and start the 12 Week arms Workout routine. In the next section you’re getting your shinny new training routine that’s designed to not only maximize arm growth, but build muscle over your entire body. This is the point where the rubber meets the road! I know you’re excited to hit the gym and get started with this arm development workout program. But before you do, I want to explain how this program has been designed, and why it’s so effective. Over the next 12 weeks, you will be rotating between two different workout routines. Each workout has been intelligently designed to stimulate as much arm muscle growth as possible. Real muscle… not some temporary “pump” that most other arm building programs provide. The workouts are a modified version of the classic push, pull, legs training split. The push/pull/legs split is a weight training schedule that revolves around splitting the body up into 3 groups: upper body pushing muscles, upper body pulling muscles and legs. Each group is then trained separately on its own workout day. The push/pull/legs routine is a highly effective mass building training split as it stands. But I have made a few modifications to this routine to maximize arm development while also working all other muscle groups of the body. The main addition to this routine is an “arms” day. With the addition of the arms training day you will now be training arms twice per week. Small muscle groups such as biceps and triceps recover faster than larger muscle groups, so smaller muscle groups can be worked with a higher training frequency. By training the arm muscles twice a week you will be getting in more growth stimulating workouts over the next 12 weeks. This program includes big compound exercise for the large muscle groups. A lot of arm development programs out there will have you completely neglect training other muscle groups of the body. As I’ve talked about before, big compound exercises for large muscle groups such as chest, shoulders and back also stimulate arm growth. By including these exercises you will be able to really overload your arms with a lot of weight when you are training the larger muscle groups. You will train biceps on Day 1 (arms day), then again 4 days later when you train all “pulling” muscle groups. Triceps will also be trained on Day 1, then again 3 days later when you train all “pushing” muscle groups. I have created this structure so that you’re training 4 days a week on a fixed schedule. So you are working out on the same days every week, with weekends off. I have designed 2 workouts (A and B) that you will rotate between each week. …and so on for 12 weeks. 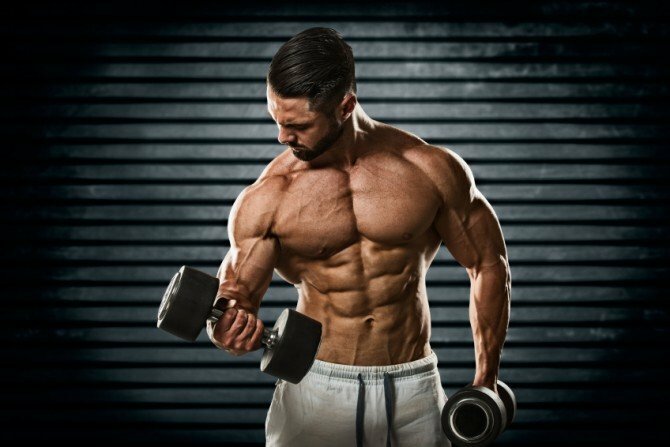 Two rotating workouts have been created to fit in all the most effective muscle building exercises for the arms, and to thoroughly work them for different angles and to stimulate muscle fibres through all points of the strength curve – No potential stone for growth has been left unturned. Another advantage of the rotating workouts is that it allows you to hit each muscle group of the arms with maximum intensity. For example, workout A on week 1 starts with biceps, and then triceps are trained. When you rotate to workout B on week 2 you will start by training triceps, then biceps are trained. This provides the opportunity to hit each muscle group of the arms with maximum intensity when you are fresh. If you were to always train biceps first on arm day then your intensity may drop slightly when you move onto training triceps. Meaning triceps would always be trained when your energy levels start to fall. Rotating between workout A and B each week eliminates this potential problem and gives you a day each week where you can really focus in on each muscle group with maximum intensity. NOTE: Do not use the program all year round. It is a slightly unbalanced program with a focus on maximizing arm growth. This means that other muscle groups such as chest, back, shoulders and legs will be trained less frequently. Therefore growth of these muscles will be less than the arms. The program is designed to be run for 12 weeks (or up to 16 weeks) to bring up arm development. Each muscle requires a sequence of warm up sets. This will activate and prepare the muscles and central nervous system for the heavy working sets. Increase synovial fluid in the joints. Opening of capillaries to muscles. Metabolic adjustment to heavy loads. Warm up with the following sequence before working each muscle group. You don’t need to do this before every exercise, just once before you start training the muscle. Each set gets heavier as you add more weight, gradually increasing the weight with each set, with the final warm up set being your working weight. Don’t obsess over resting times between sets. Take anywhere between 1 – 2 minutes rest between sets for small muscle groups (biceps, triceps, shoulders) and for big taxing exercises such as squats or deadlifts take up to 3 minutes. It’s essential that you know how to perform each exercise correctly to maximize growth of the target muscle and reduce the risk of injury. If you are unsure of how to perform any exercises then take some time to watch tutorial videos and learn the exercise. How do I follow this program? This arms growth training program consists of two workouts (A and B) that you will rotate between each week. Week 1 you will perform workout A, week 2 you will switch to workout B, then back to workout A, and so on for twelve weeks. For example, workout A will have you train arms on Monday, Legs on Tuesday, then Wednesday off. Follow the program as shown above. To recap, what you’ll be doing. Week 1 you will start with workout A, then week 2 switch to workout B, then week 3 workout A, then week 4 workout B. You will continue alternating between workouts A and B every week for the next 12 weeks. What is the logic behind this training program? The program is designed to recruit and stimulate as many muscle fibres in the arms as possible over 12 weeks. Each exercise is research proven as the best to trigger muscle growth, and the program is structured is such a way to maximize muscle tension though all points of the strength curve. When is best time use this program? This training program is the perfect solution for anyone who wants to accelerate the growth of their arm muscles. It is ideal for both beginners and experienced lifters. You can use this program if you are a complete beginner to weight training and want to get a head start on your arm growth. Maybe you just have very skinny arms and want to fill the gap in your t-shirt sleeve, or maybe you just want big guns to show off. This is the ideal program if you have already been training for a while but find that your arms are a stubborn muscle group that don’t grow in proportion to other muscle groups. Follow this program for 12 weeks then go back to your usual training routine or any body part split that works every muscle group in the body evenly. Remember, this is a slightly unbalanced program that is designed to increase muscle growth of the arms faster than other muscle groups. You should only use this program for 12 weeks then switch to a balanced training program for 6 – 12 weeks before using it again. Should I train to failure on every set? A) The point in a set when you can no longer perform another full positive rep unassisted and with good form. B) The point where you are screaming, spitting, shitting your pants, bursting blood vessels in your eyes (I’ve seen it happen) and form has broken down to the point where every other muscle in the body is recruited to move the weight. When I say “train to failure” I am of course talking about point A. It would not be possible to complete every set if you trained to true failure as described in point B, you would burn yourself out to early… and would need a change of pants. You should be working with a weight that is 75 – 80% of you 1 rep max. This means a weight that causes you to reach failure around the 8 – 10th rep. Your last two or three reps should be very difficult and require a lot of effort. But you should be able to maintain good form until your last rep when you can no longer lift the weight to complete another rep.
What do the rep ranges mean? Around 8 – 10 are the number of repetitions prescribed for each set to maximize muscle hypertrophy (muscle growth). If you reach the point of muscle failure on the 6th rep, does that still count as a working set? Yes, absolutely, but reduce the weight slightly on your next set so that you are able to perform an extra couple of reps, causing you to fail within the prescribed 8 – 10 rep range. If you go beyond 10 reps and reach muscle failure on the 13th rep, does that sill count as a working set? Yes, this will also still count as a muscle building working set, but increase the weight slightly on your next set so that you fail within the prescribed 8 – 10 rep range. If you’re a beginner it will take a bit of trial and adjustment to find your working weight. Most experienced lifters know how much weight they can bench press or curl for 10 reps. Remember, this working weight will change over time as you get stronger. You should always be pushing to increase your working weight by small amounts over time. When 10 reps of a particular weight starts to feel lighter as your strength increases it’s time to increase the weight so those 10 reps are always heavy and hard to complete. Should I train a muscle if it’s still sore from a previous workout? Muscle soreness that occurs after exercising is called “DOMS”, or Delayed Onset Muscle Soreness, and feels like the muscle is bruised and aching. As the name implies, its onset is delayed, usually by 24 to 72 hours (can be as long as 7 days for beginners); it also takes longer to subside than short-term muscle failure. Think of how your legs might feel a day or two after a lot of heavy squats and you have to take the stairs. That’s an example of DOMS. This type of delayed soreness, depending on its severity and duration, has the unfortunate effect of hindering activity of the muscle until it subsides to a tolerable level. Some muscle soreness is fine to work through. If it’s very painful then you may need to back off a little (fewer sets, lighter weight) when training that muscle again, or take a day off. Beginners are very prone to DOMS, sometimes quite severe. But your muscles will adjust to the stress of training and DOMS will become much less over time. Muscle soreness is not an indicator or necessary for muscle growth. You will adapt to the training and DOMS should subside. If you feel any persistent pain around your joints, stop all exercise and get yourself check out by a doctor. The most common places that people develop injuries are the tendons around the elbows and shoulders, so be aware of any pain developing around those areas. The main reasons why people develop tendon or joint related pain is bad exercise form. This is why it’s crucial that you learn how to execute every exercise with perfect form. Should I do any cardio work? This is a muscle mass building program. It is not an endurance training or fat loss program. Cardiovascular exercise is not required as part of this program. However, I do believe that everyone show incorporate some kind cardio exercise into their weight training program at least one day a week for health benefits. Regular cardio keeps your heart fit and healthy. Pick one of your rest days (not after leg day) to get some cardio work in for cardiovascular health. Why is there no exercise for abs in the program? A lot of the exercise in the program will help build a strong core so there is no real need to do any isolation work on the abdominal muscles. This is an arms focused program that also provides a good level of stimulation to all other muscle groups on the body. If you want to include some direct ab work into the program that’s fine, you can include some exercise on leg day. But if you have over 10% body fat then you won’t be able to see your abs anyway, and training your abs will NOT burn belly fat. This is an arms focused mass building program. Developing good 6 pack abs requires a completely different training and nutrition program.